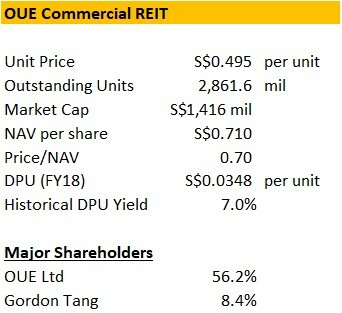 Whilst OUE C-REIT’s DPU yield and Price-to-NAV appears to be attractive vis-à-vis its peers, investors should take note of the implications of the S$375 mil Convertible Perpetual Preferred Units (“CPPU”) and its impact on OUE C-REIT’s DPU going forward. Assuming that all S$375 mil CPPUs are converted, a total of 524.2 mil new OUE C-REIT will be issued to OUE Ltd, and the total unit base of OUE C-REIT will expand by 18% to 3,385.8 mil units. For minority investors of OUE C-REIT, they face the risk of having their DPU yield diluted from a projected 7.1% (before conversion) to 6.2% after conversion. A Rights Issue to fund CPPU Redemption will be more dilutive than the conversion scenario. Assuming a Rights Issue at 20% discount, DPU yield of OUE C-REIT will drop from a projected 7.1% (before conversion) to 5.8% after Rights Issue. Minority investors are likely to be at the losing end of this CPPU issue and suffer from yield dilution. Investors should avoid OUE C-REIT for now as the uncertainty over the CPPU conversion remains. For investors who are still keen to take a position in OUE C-REIT, a fair post-conversion diluted DPU yield would be 6.6%, translating to a recommended entry price of S$0.465 per unit. BGF Sub had a 5.39% gain on better-than-expected 4Q18 results. Holdco stayed flat. As a result, we had a 2+σ jump from 95% of σ to -133% of σ. This is the widest jump in 120D. Holdco discount is currently at 47% to NAV. On a 120D horizon, price ratio is still well below 120D mean. Despite recent gains, Holdco price relative to Sub is nearly 20+%p down since 120D ago. 4Q results seem to be encouraging. But local sentiments are still heavily divided on Sub’s fundamentals. 4Q results aren’t strong enough to turn the tide drastically. Sub has been one of the most heavily shorted stocks in Korea lately. Yesterday’s huge gain might have been a short covering. This shouldn’t be a structural price pushing up for Sub. Sub staying below -1σ wouldn’t last another day. I expect a quick mean reversion at this point. Valuetronics reported its 3Q19 figures this week which showed a 7.5% decline in revenues but a small (+2.6%) increase in bottom line profits. Stronger margins in its ICE segment offset weakness in its CE segment. Valuetronics Holdings (VALUE SP) remains a solid company run by a good management team with interesting clients in consumer electronics and automotive. The valuation of the company is cheap (5x ex-cash 2019 P/E) and the balance sheet is rock solid. All these positives are currently being overshadowed by the US-China trade war as the company has 100% of its production in China and does 45.7% of its sales in North-America. While many companies try to downplay the impact of the trade-war Valuetronics cannot hide and the alternatives it is working on to offset the tariff impact will surely cause short-term disruption and increased costs. YTD the share price is +12% as the market is hoping for a positive resolution to the US-China trade war. Management is cautious on macro political improvements as trade war friction is unlikely to dissipate soon. Given the weak outlook for its CE segment and no significant new customer wins in its ICE segment risk/reward does not seem very attractive despite good dividend yield and cheap valuation.